Gift Boxed 4 Different Designs. Faith, Grace, Hope, Love. 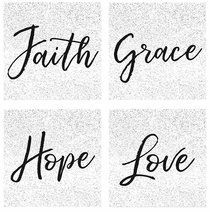 About "Ceramic Square House Coaster Set of 4: Classic - Faith, Grace, Hope, Love, Black/White"